As one of the largest manufacturers of acrylic baths in the UK, Trojan take unprecedented pride in each one of their baths. All the way from design, production and finally to the launch of a new bath, Trojan ensure that each quality check reaches only the highest of expectations. This stunning bath comes complete with a stunning body massage system comprising of 6 large jets combined with 2 plantar jets and 3 lumbar jets. Add a 12 jet air spa system for only £250.00 Inc Vat. 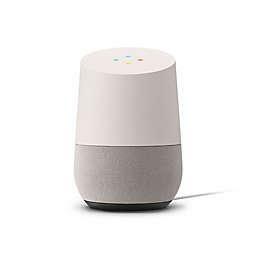 Normally £279.99 Inc Vat. The 12 jet air spa system will be fully fitted to your bath giving you lovely 23 Jet whirlpool spa bath for only £589.98 Inc Vat. Select above. Thank you very much, lovely product and great service. Excellent service. Easy to use website and delivery as promised. Our Whirlpool bath is amazing! Trojan Cascade 11 jet whirlpool bath. Omg. An amazing whirlpool bath at an amazing price. Love it. Adjustable control on the jets which powerful. When I ordered they rang me to see where I wanted the controls and I changed the waste plug end too. Brilliant service. Such friendly helpful people too. This bath was stunning and looks fabulous too in my new bathroom. Totally recommend this company and their spa baths. The Product is good quality/price. As to durability I can not say because it is only just newly installed. I asked plenty of questions which were kindly responed to and the advice given was very helpful for installation. Delivery was fine although the transport company charges an extra £ 15 to deliver to London Suburbs (no Congestion Charge) - I forgot to ask, but maybe they dont charge £ 15 to deliver to Land's End. Everything arrived in working order, no damage. Very helpful when I phoned to put my order in. Brilliant company I would definitely buy from here again! Delivery man was also very nice and helpful. I was impressed by your prompt and efficient delivery of my Jakuzzi bath,and after my first use of it, can report that I felt relaxed,refreshed and invigorated . Well done Whirlpool Bath Shop.Thank you. James Miller. Order went smoothly.packaged well and delivered on time.good experience. We bought a jet whirlpool bath some years ago from this company, through this site. At first I was a bit worried as It was early days of me using this site and a computer. I needn't have worried this company sells baths that are of a high standard, deep and look much more expensive than they are. We used our old bath twice a day for years! In fact the motor of the old bath still works! !My husband and I both have serious illness's, these jets help our muscles to relax and therefore lessen our pain. Being a retired nurse, I prefer to lessen my intake of pain relief tablets. These baths are excellent for easing pain,the jets are quite strong but you can easily adjust them to your liking by turning the air turbulence control. When our new bath came we had a problem of a seal leaking. I phoned the company immediately, the girls phoned back within an hour and promised to sort it out. My plumber said it was just a bit of glue needed, I discussed this with the girls as I didn't want to do anything before talking to the company, they recommended I go ahead and get it glued. If that didn't fix our problem they would send out parts for us and cover the plumber costs.At least we have peace of mind buying from a very reliable and reputable company. Well done, I highly recommend these baths and the company. half the price of my local diy store and came assembled all pipes ect. 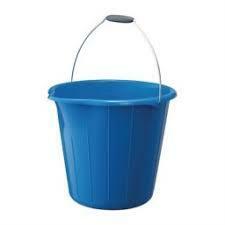 Quick free delivery to other end of the country fantastic product at a great price, a great addition to any bathroom. Thanks to the whirlpool bath shop. The most helpful company I could imagine. Really excellent service & a great bath. Thanks to all your staff! Buying was really easy process. Placed order online and got a call back couple of days later to confirm the order. It then got delivered next week. Really good customer service. Answered my queries before I placed the order to finalise the product I needed. It’s not fitted yet but hoping to have nice whirlpool baths soon. Customer service excellent. Spa bath as described. Great quality and price. Would recommend! Apart from the good price, their communication regarding the product ( where do we want the controls etc.) was first class. Delivery was on the day stated and the product was well wrapped to protect it. Now that we installed it you can see that its a well made product which will give us many years of good service. My daughter has sensory processing disorder and absolutely loves the bath it relaxes her. Very easy transaction. Was kept informed every step. The bath was delivered on the day and time agreed and was packaged very well. It has been installed and looks great but we have yet to use it but definitely looking forward to it. Amazing product so relaxing. Easy process from start to finish whirlpool kept us updated which made simple enough to order thanks. I am stressed and very tired at the end of the day. My whirlpool bath just whirls my daily troubles away . It is a heavenly treat. Best investment I ever made. As trade clients the Whirlpool Bath shop are specialists in this line of products and are knowledgeable providing good customer service to back that up. We look forward to doing more business with them for our future developments. Q: Please confirm delivery time. Hi Tom, currently delivery on this bath is 2 - 3 working days. Q: Question for those with long hair. Is there a chance that hair could get tangled up in the jets? Maybe a silly question but one I really need to ask. Thank you. No, the only push out water and air, no suction. Q: What amp fuse would I need to install into a fuse spur for this bath please. Q: Hello Does this bath come with overflow/waste etc? I'm aware the taps are not included but the other fittings are in the photos but not in the list of parts supplied, (unless I missed them). Thanks, Kieron. No waste supplied. 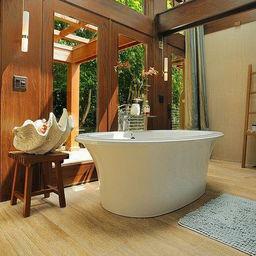 Price is for the bath only with the whirlpool system. Hi, they do yes, it's a brand new whirlpool bath. Please see the product reviews at the bottom of the description. Hi, we don't install. The only difference between a whirlpool and a plain bath is the electrical connection so you just need a plumber or bathroom fitter and an electrician to make the connection. Q: Hi What side is pump of this barh ? Will it be at the tap end or other end? Hi, it will be at the opposite end to the tap. Hi, no. The jets just push out air and water, no suction. Q: Are these bathtubs easy to fit. I have plumber in doing bathroom. Or do I need electrician as well? Silly question but please let me know. Thank you. Hi Jenny, you would need an electrician to make the connection, everything else is the same as plumbing a plain bath. Q: Hi there. 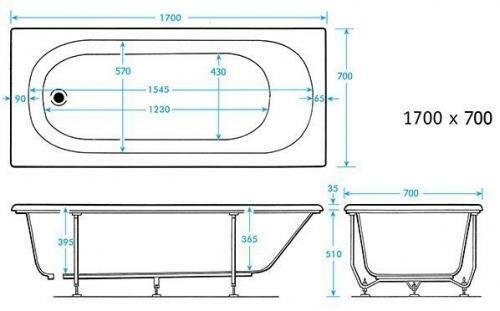 Do you have a showroom we can visit to see the Trojan Whirlpool Bath and any other straight 1700mm long options please? Many thanks. We don't but you're welcome to our factory to view this bath along with others. Hi, no. Just operates via an on/off air switch. The legs are adjustable. Some more info below. Q: what is the length of the warranty on the whirlpool system not just the bathtub thankyou. Thanks for your message. It is not possible to fit taps on the 1700 side of the bath I'm afraid, the ledge is too narrow. You would need a double ended bath with tap mounts in the centre, the alternative would be to wall mount the taps on the 1700 side, the waste location would still be at the 700 end, this is pre drilled. 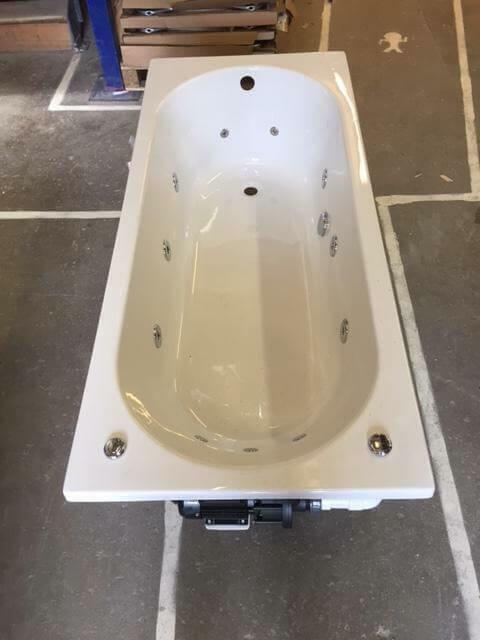 Link below to our 1700 double ended baths. Q: what does the motor cost to purchase to run the whirlpool bath? Hi, the motor is included in the price. It doesn't, your installer would drill these. It's suitable for a shower screen on the side.